The most recent Fed balance sheet data are summarized here. Note where the Fed was yesterday (12/29/10) relative to a year ago (12/30/09). On the asset side, "securities held outright" has increased by about $300 billion, with an increase of about $230 billion in long-maturity Treasuries, and a net increase of about $70 billion in agency securities and mortgage-backed securities. However, on the liability side, the increase in outside money has been quite small, at about $15 billion ($54 billion increase in currency, $39 billion decrease in reserves). 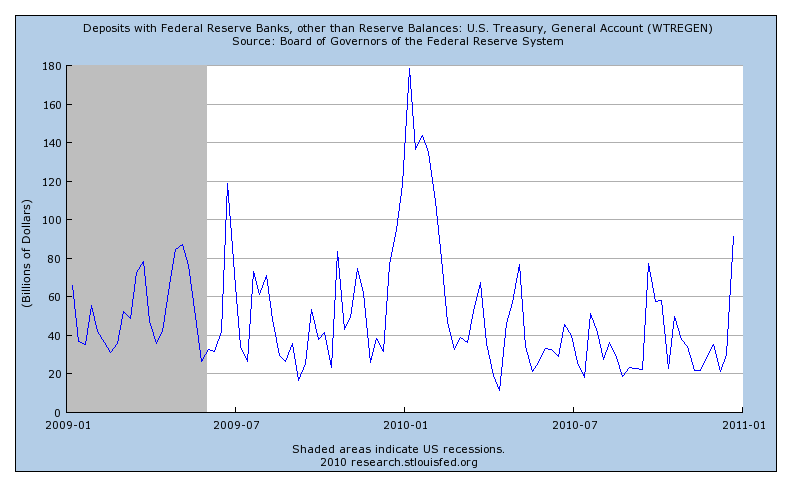 As I remarked here, what is going on with Treasury reserve accounts at the Fed is important. During the year, the balance in the Treasury's general account dropped by $31 billion, but the Treasury also accumulated $188 billion in its "supplementary financing account." This supplementary account was created in September of 2008, and is described here. Basically, the Treasury sells T-bills, in exchange for reserves, and deposits the proceeds in this supplementary account. The balance in this account peaked at about $560 billion in November 2008, went to zero for a period late in 2009, and rose to about $200 billion in April 2010, staying constant at that level since. The Fed thinks of this as a reserve-draining operation. Thus, once we take account of accumulation of reserve balances by the Treasury, and reductions in lending by the Fed, total outside money has increased little in the past year, in spite of a net accumulation of $300 billion in securities. Indeed, if we take the Fed seriously that it wants to "quantitatively ease," it is not doing it, since the total quantity of Federal Reserve liabilities in the hands of the private sector declined in real terms during 2010. The interview is a nice summary of Gary's work, and you can read more about it if you follow the references. His regulatory reform proposal for "narrow-funding banks," is particularly interesting. 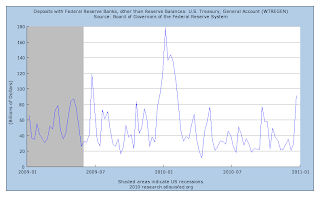 The QE2 asset purchases by the Fed began in early November. The plan was to increase the Fed's holdings of long-term Treasury securities by about $75 billion per month until the end of the second quarter of 2011. In the chart, the blue line is securities held outright by the Fed, which has been increasing at a steady rate, as planned. Of course, the Fed has to issue liabilities - outside money - to finance these purchases. 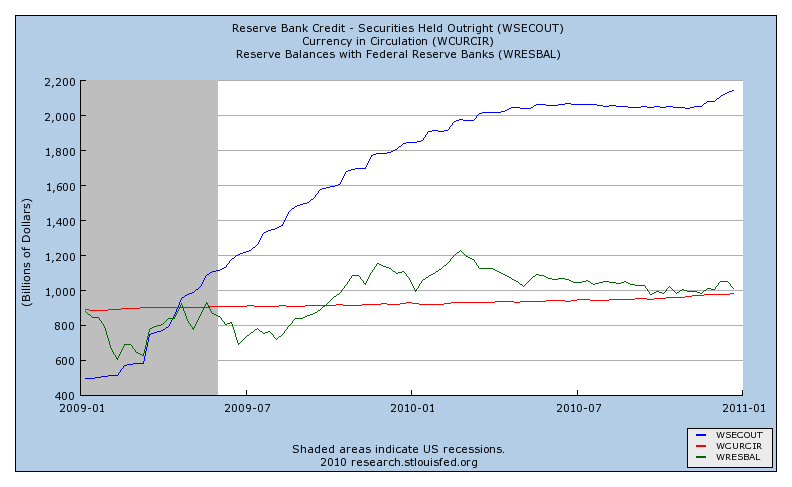 However, reserves (the green line), and currency (the red line) show little increase since the beginning of the program. What's going on? Of course, the Fed's balance sheet balances, so the increase in security holdings has to be reflected in an increase in liabilities other than outside money, or in a reduction in assets other than securities held outright. In the next chart, we can see who the culprit is. The Treasury's general account at the Fed shows an increase of about $70 billion to date in December, which would roughly account for the missing outside money. The general account is where tax receipts and the proceeds from new Treasury issues are deposited. It is not clear what the source of such a large movement in the general account balance is. It certainly is not seasonal, as we don't see changes in the Treasury's general account on this order before the financial crisis. The big question here is why the Fed does not offset, on a daily basis, net withdrawals or deposits from the Treasury's account with the Fed. 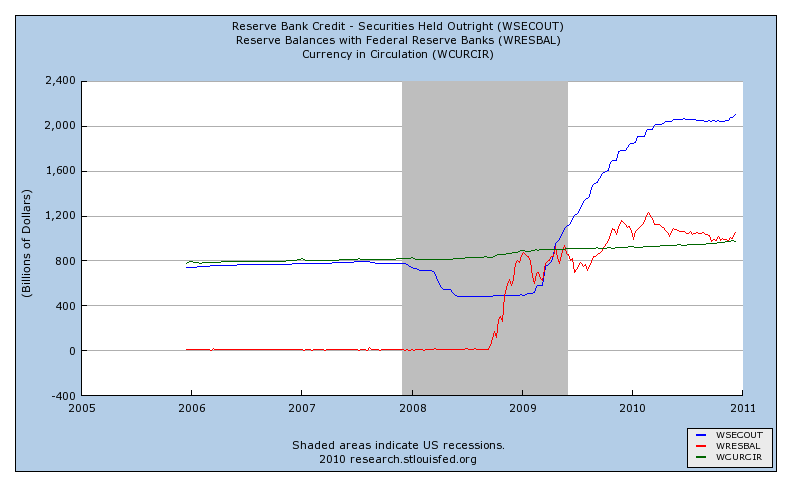 Fed officials seem to think that QE2 works through action on both sides of the Fed balance sheet. If QE2 has any consequences, it seems the Fed should want to minimize financial market disruption by smoothing the path of outside money. Why isn't that happening? The recent behavior of commodity prices seems to have provoked a politically-infused controversy over how this behavior relates to monetary policy. Let's see if we can find the light amid the heat. In some kinds of monetary systems, commodities play critical roles. Indeed, in the earliest monetary systems, scarce metals - typically gold and silver - were the medium of exchange. At the time, such commodity money systems were efficient, as gold and silver were difficult to replicate (counterfeiting was costly), and were relatively portable. The cost of such systems, however, was the diversion of resources (gold and silver) from private use. Further, making very large or very small transactions, for example in gold, could be difficult. Large transactions could involve a very heavy and bulky quantity of gold, while a small transaction might require such a small quantity of gold that divisibility would be a problem. With the advent of technologies to thwart the counterfeiting of paper currencies, the designers of monetary systems took the next step, which was the adoption of commodity-backed paper money. Under such systems, for example the gold standard, some governmental institution stood ready to exchange a commodity for money at a fixed price. Under some conditions this could lead to price stability. For example, if the central bank fixes the price of gold at $1000 per ounce, and there is pressure for prices to rise, people will want to buy gold from the central bank at a low price and make a profit selling it at a higher price. In the process, the quantity of money in circulation falls, and prices fall. The problem here is that, while the price of gold is fixed with respect to money, the price of gold need not be fixed relative to the prices of other goods. Indeed, if there is an increase in the demand for gold for consumption purposes relative to other goods and services, the relative price of gold must rise, which means the prices of other goods and services in terms of money will fall, and there will be a deflation. Similarly, if new technologies come on line that lower the cost of digging gold out of the ground, this lowers the relative price of gold and leads to an inflation. Thus, while a gold standard has the advantage of keeping monetary policy out of the reach of misguided or ignorant policymakers, the price level will fluctuate due to demand and supply factors in the market for gold, and this will be harmful. Modern fiat money standards therefore have advantages. Currency can be produced at relatively low cost, central banks are able to control inflation and inflation variability in the face of fluctuations in the relative prices of commodities, and individual countries can, if they wish, pursue independent monetary policies. Of course, under a fiat standard we have to trust the people who set the rules within which our central bank operates, and we have to trust the people who make monetary policy and implement it. Two Republicans who will have significantly more power over economic policy in the new Congress, and who are also on the record as showing an interest in the role of commodities in the monetary system, are Ron Paul and Paul Ryan, both in the House of Representatives. I have not read Ron Paul's book "End the Fed," but part of the program he advocates in that book is a return to the gold standard. Ron Paul's ideas are not completely crazy. That some central banking functions - for example the issue of currency and the operation of the payments system - could be taken over by the private sector, are issues that are debated seriously by monetary economists. However, in the case of the gold standard, the appeal to Ron Paul, and to other gold bugs who have advocated the idea from time to time, seems more like the appeal of horses and buggies to the Amish rather than anything to do with sound economics. As discussed above, volatility in the relative price of gold makes a gold standard perform poorly. Paul Ryan is on record as an advocate of commodity price targeting by the Fed. I have not been able to find a place where Ryan has written this down in detail, but the idea seems to be that the Fed should target the rate of increase in the price of some basket of commodities. This is something like a commodity standard, but does not involve the Fed holding any claims to gold, silver, pork bellies, wheat, or whatever is contained in the commodity basket. Of course, Ryan's proposal has the same disadvantages as does the gold standard. Commodity price indexes are well-known to be highly volatile relative to consumer prices, for example, and commodity prices are volatile because of demand and supply factors that are idiosyncratic to those markets. Thus, while it may be feasible for the Fed to target commodity price inflation, this would serve only to make consumer prices and interest rates much more volatile than is currently the case - a very bad idea. Now, what has been happening to commodity prices recently? The chart shows the year-over-year percentage change in a commodity price index for the period January/92 to November/10. The first thing to note is that the 12-month growth rates in this index show volatility on the order of what we see in stock price indexes, and for good reason. Physical commodities are storable, and therefore they are assets. We should expect then, that the prices of commodities should behave more like other asset prices, than like the prices of final goods and services. 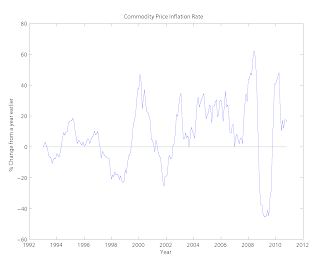 Indeed, over the pre-crisis period in the chart, the rate of change in the commodity price index goes from -20% to well over 40%, back to the neighborhood of -20%, up again to the 30% range, down to 0, and up to more than 60% per annum, during a period where consumer price inflation, by any measure, was quite stable. Right now, rising commodity prices are basically the result of global recovery. They have no bearing, one way or another, on U.S. monetary policy. For this is a global story; at a fundamental level, it’s not about us. So, if Bernanke is right and QE2 acts in part by increasing asset prices, it should increase commodity prices. Commodity prices of course started their recent increase in September of this year, at a time when it had become clear that QE2 was coming, so it seems hard to dismiss US monetary policy, as Krugman does, as a cause of the recent commodity price run-up. Now, what is causing the run-up in commodity prices is in fact critical for US monetary policy. First, suppose that, as Krugman suggests, the current commodity price inflation is due only to changes in the world demand for commodities. In fact, he appears to be arguing that the relative price increases are in part permanent. This then would be an instance where focusing on core measures of inflation is a bad idea. If we are experiencing permanent increases in the relative prices of energy and food, and our target inflation rate is 2%, we should be tolerating a core inflation rate of less than 2%. In that case, the goal of QE2 of increasing the core inflation rate seems wrongheaded. Second, suppose that the increases in the US dollar prices of commodities are the result only of QE2 (and anticipated QE2). Then, judging from history, the run-up in commodity prices is not such a big deal. This is just the beginnings of a widespread increase in general inflation, which is what we want anyway. When politics and economics meet, the result looks like what happens when the Arctic air mass (sometimes know here as "the cold air from Canada") meets the warm air from the Gulf of Mexico in the Mid-West. You get some thunder and lightning, and it's hard to see what's going on. As should not surprise anyone, the financial crisis has created opportunities for virtually everyone to promote their own ideas, by blaming the people they don't like for causing the crisis or not seeing it coming. What did Fannie Mae (the Federal National Mortgage Association), Freddie Mac (the Federal Home Loan Mortage Corporation) and the CRA (the Community Reinvestment Act of 1977) have to do with the financial crisis, and why should we care? Some unhappy campers - the Republicans on the Financial Crisis Inquiry Commission (FCIC) - claim here that Fannie, Freddie, and the CRA had a lot to do with the financial crisis. This guy and Paul Krugman (here and here), among others, claim that the unhappy campers are liars, and that their ideas were debunked long ago. Obviously some people are not agreeing. Let's see if we can learn something here. The CRA was certainly well-intentioned. Enacted in 1977, the Act was intended to correct problems of discrimination in lending by commercial banks. However, the law does not deal explicitly with discrimination, but instead works on promoting lending by commercial banks in the communities in which they draw deposits. There are no explicit penalties for bad behavior. Instead, the idea is to work through regulators - the Fed, the FDIC, the Comptroller of the Currency, for example - to monitor compliance with the law. Compliance is somewhat vague, and the regulators appear to have some discretion to determine what compliance means. Basically, the thrust of the law is to increase lending by commercial banks to poor people. Now, the CRA seems like a poor piece of legislation. Straightforward Econ 101 tells us that, if the goal is to help poor people, it is more efficient to do this by simply giving them money rather than coercing someone else to help them. Of course, we know why governments tend to prefer mandates (No Child Left Behind comes to mind) rather than actually putting up the money, as mandates do not show up on the government's balance sheet. In the case of the CRA we have created a substantial bureaucratic cost. For example, every Federal Reserve Bank has a group of people, typically lodged in a community affairs department, whose sole purpose is to monitor compliance with CRA. These people take up space and are paid salaries. Further, it is not clear that CRA is effective. To the extent that banks would otherwise be compliant, the CRA just imposes costs on them - time wasted filling out forms. Further, if complying with CRA means engaging in unprofitable lending practices, this could cause commercial banks to close up shop in poor neighborhoods. Now, what about Fannie and Freddie? These "government-sponsored enterprises" (GSEs) have a long history. Fannie Mae was created in 1938 as a governmental institution, but became "private" in 1968. Freddie Mac, in turn, was established in 1970. Today, Fannie and Freddie function essentially identically, and are of similar size. They are financial intermediaries that purchase residential mortgage loans from originators and either hold the loans in their own portfolios or package them as mortgage-backed securities (MBS) to be sold. Each institution issues debt (agency securities), and can purchase mortgage related assets, for example MBS created by other financial institutions. Fannie and Freddie receive special treatment, in that their debt is implicitly guaranteed by the federal government (a guarantee made explicit in September 2008), they pay no state or local taxes, and they are exempt from some securities regulations, among other things. Is there a sound economic rationale for the existence of institutions like Fannie and Freddie? I don't know of any other high-income country where such institutions exist. Did those other countries somehow miss the boat? There are two issues here. The first relates to the role of securitization, and the second to whether securitization is necessarily a government activity. I like to use Canada as an example here, partly because I know something about it. In Canada, there is some securitization of mortgages, but most mortgage lending is done by chartered banks with the loans held in the banks' portfolios. Canadian banks do not securitize because they are large and geographically diversified. The reason securitization is important in the US is that we still have a large number of small banks which, if they held loans backed only by local real estate, would be poorly diversified. But do we need the government to sponsor the securitization of mortgages? Absolutely not. There is no good reason why private financial intermediaries cannot perform the same function. Of course, financial crisis experience highlights in a dramatic way the incentive problems associated with securitization. Indeed, this suggests why a banking system with large banks that hold loans in their portfolios (as in Canada) has advantages over a system with many banks and securitization. Of course, Fannie and Freddie do not represent only an attempt by the government to replicate an activity that would otherwise be carried out by the private sector. The implicit government guarantees and favorable regulatory treatment are subsidies to the housing sector. In the United States, the housing sector has long been a sacred cow, and receives other subsidies, including the mortgage interest tax deduction. Is there an economic rationale for these subsidies? I have heard some people argue that there is a positive externality associated with home ownership. The idea seems to be that homeowners somehow take a greater interest in their communities than do renters. Baloney. First, Canada has achieved a higher home ownership rate (67%) than in the US (65%) without a mortgage interest tax deduction or any mortgage market intervention on the scale of Fannie and Freddie. This suggests that US housing subsidies show up more in the the quantities of resources allocated to the housing sector in each country rather than home ownership rates. Further, Germany has a home ownership rate of 43%, but I doubt that Germans are less community-minded than Americans. Indeed, people in other countries typically characterize Americans as being much more interested in their large houses than in public amenities like parks. Now, how are Fannie, Freddie, and the CRA tied together? The Federal Housing Enterprises Financial Safety and Soundness Act of 1992 indirectly affected CRA compliance by requiring (note: another federal mandate) that Fannie Mae and Freddie Mac devote some of their activities to affordable housing. This of course is one of the dangers of financial institutions that are closely allied with the government. The temptation always exists to use these institutions as instruments of policy, once again by using mandates to accomplish policy goals rather than using tools that affect the government's bottom line. While the CRA seems wrongheaded, the unhappy campers on the FCIC appear to be barking up the wrong tree in attributing an important role to CRA implementation in the financial crisis. I'm sure the banking industry would love to get rid of CRA, and I can see why attaching a goodbye-to-CRA element to a financial industry reform bill would be legislatively practical, but I don't think this one flies. Was government policy entirely innocent? No, but its sins were more of omission than commission. Fannie and Freddie shouldn’t have been allowed to go chasing profits in the late stages of the housing bubble; and regulators failed to use the authority they had to stop excessive risk-taking. But as much as conservatives would like to put soft-hearted politicians at the center of this story, they don’t belong there. And Rajan’s endorsement of the conservative story line, without even an acknowledgment of the problems of that line, comes across as slippery and evasive. There are two story lines. First, the government-as-bad-guy story is that Fannie and Freddie, encouraged by the government, lax regulation, and their implicit subsidy, played a central role in encouraging incentive problems in the mortgage market, thus playing a crucial role in pushing up the prices of houses. This then laid the groundwork for the subsequent crash. The second story line is the private-sector-as-bad-guy story. Private mortgage originators, in league with the shadow banking system and the credit rating agencies, caused the incentive problems, and Fannie Mae and Freddie Mac went along with this to a small extent (so as to retain market share). 1. Fannie and Freddie's market share fell during the period leading up to the crisis. See this for example. Figure 1.2 shows a drop in the flow of new MBS by Fannie and Freddie from about 2004-2007, as subprime activity takes off. 2. The bust happened in commercial real estate as well as residential. Fannie and Freddie can only deal in residential-mortgage-related instruments. If the problems were more widespread, it can't be Fannie and Freddie causing the problem. 3. Other countries experienced housing booms and subsequent busts during the same period. Since Fannie and Freddie do not have any direct influence on housing markets in other countries, something else is going on. See (2). There are counter-arguments to all of these points. With regard to (1), Rajan points out, in his rebuttal to Krugman's review of his book, that looking at MBS issues leaves out an important part of the story, as Fannie and Freddie both purchased substantial quantities of risky loans from originators that sat in their own portfolios, and purchased MBS from other issuers. On (2), residential and commercial real estate are clearly complementary. For example, a new housing development comes with a strip mall. In principle, high demand for housing fueled by indiscriminate lending encouraged by Fannie and Freddie also increases the demand for commercial real estate. On (3), this is neither here nor there. The large runups in house prices in other countries happened for various reasons. Whether those runups happened or not has no bearing on how I think about the role of Fannie and Freddie in the financial crisis. However, consider (again) Canada as an example. This is useful, as real GDP followed a similar path in the US and Canada during the recession, and we can sometimes think of Canada as the 51st state or the the 13th Federal Reserve District. However, the financial systems in Canada and the US are very different. During the financial crisis, there were no incentive problems in Canadian mortgage markets, no banks were severely stressed, no banks failed, and there were no bailouts. 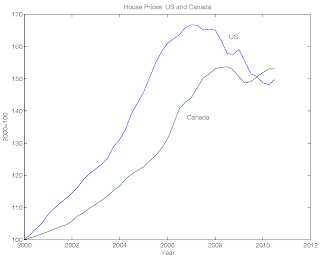 The chart shows housing prices in Canada and the US, from 2000 to the present (St. Louis Fed's housing price index for the US, Statistics Canada New Housing Price for Canada). 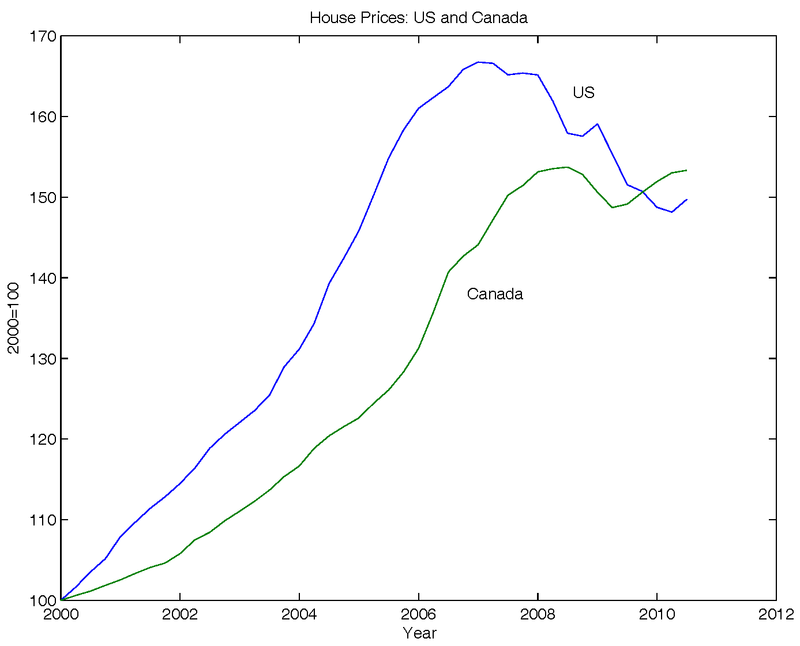 As you can see, prices in Canada rose at a lower rate, on average, prior to 2006, when the housing bust begins in the US. Canada experiences only a dip in housing prices during the recession, with prices in Canada currently back to their peak. What does this tell us? It's certainly consistent with the idea that incentive problems in the US mortgage market drove up prices, it runs counter to the arguments of the private-sector-as-bad-guy story-tellers, but this does not tell me anything about what to attribute to Fannie and Freddie. 1. Forget about good guys and bad guys. If there was anything that the financial crisis taught us, it is that risks and incentives in the financial market have to be evaluated systemically. For example, a regulator may have considered a bank's holdings of MBS as low-risk, since they were insured by AIG, without taking account of the fact that AIG would in fact not be able to pay out on all its claims in some states of the world. Fannie and Freddie, like all other large financial institutions, played important roles in the financial crisis. Can we quantify those roles? Because of the complicated relationships among financial institutions, I think this is impossible. 2. We need financial reform that will unwind Fannie and Freddie. It has been clear for a long time that Fannie and Freddie are corrupt, inefficient institutions with no important economic role. Fannie and Freddie are currently under government conservatorship and on the receiving end of a flow of bailouts from the federal government. The only question here is how the unwinding should be done. 3. It's all about the government. As Walt Kelly would have said, "we have met the enemy and he is us." Financial crises are not a given. We experience these periodic episodes because of how our financial system was designed, and by virtue of how the regulations were set up. We cannot blame the financial crisis on Wall Street, any more than we can blame children for burning down the house when they are left at home with a box of matches and a can of gasoline. The cause of the problem was faulty design and faulty regulation. The government - i.e. you and me - did it, and we need to fix it. Some people apparently are bothered by the behavior of the four Republicans on the Financial Crisis Inquiry Commission (FCIC). This piece in the Huffington Post makes it appear that the Gang of Four are out to protect Wall Street by, for example, manipulating the language in the ultimate report. Further, the Gang of Four don't like the idea that the FCIC is not meeting its December 15 deadline, and have chosen to issue a kind of pre-report, which is available on the American Enterprise Institute web site, with a statement about the intent of the group here. In case you don't know what the FCIC is up to, the FCIC web site tells us that its mission is to "examine the causes, domestic and global, of the current financial and economic crisis in the United States." Hearings have been held, various experts and officials consulted, the relevant economics brought to bear, etc., and the FCIC is supposed to tell us what happened and why. These were the best of a series of bad options, and policymakers had extremely limited information to work with. While we believe that the government deserves quite a lot of the blame for getting our financial system and our nation into trouble in the first place, we applaud the quick and decisive actions taken by our nation’s leaders during the panic. What seems to have bothered some people about the pre-report is the focus, early in the document, on Fannie Mae and Freddie Mac as key players in the runup to the crisis. Now, why anyone would want to defend the GSEs is beyond me. In the United States, the securitization of mortgages may be a necessary component of the financial system, as it promotes diversification in a banking system which still has many small banks. However, there is no reason why that securitization cannot be accomplished by the private sector (appropriately regulated of course), without government guarantees or subsidies. Fannie and Freddie, are currently under federal government conservatorship, and each continues to operate at a loss, with Fannie losing $1.3 billion and Freddie $2.5 billion in the third quarter of 2010 alone. The Dodd-Frank Act neglected to come up with a Fannie/Freddie solution, but we need one, and badly. My suggestion is that asset purchases and the issue of liabilities by Fannie and Freddie be suspended, with the assets ultimately sold off. The FOMC met this week, and released this statement yesterday. There is essentially no news here. The FOMC will proceed with QE2 as planned, and the same language remains concerning the continual review of the asset purchase program, in light of new information. Chairman Bernanke has stated that the intention of the current program is “to support the economic recovery, promote a faster pace of job creation, and reduce the risk of a further decline in inflation.”1 Proponents expect the security purchases to lower longer-term interest rates through a portfolio balance effect. That is, as the supply of longer-term Treasuries available to the public is reduced, prices of Treasuries should rise, which means yields should fall, to induce the public to willingly hold the reduced supply. Yields on similar assets are expected to fall as the public rebalances portfolios away from the asset with reduced supply toward other similar assets. Just as in conventional monetary policy, lower interest rates would stimulate business and consumer demand and increase exports, thus lending support to the recovery. Since "proponents" argue that QE2 will work through reductions in long bond yields, clearly they would like to see those reductions in the data. But, as is evident to everyone, including the NYT, bond yields have gone up, not down. 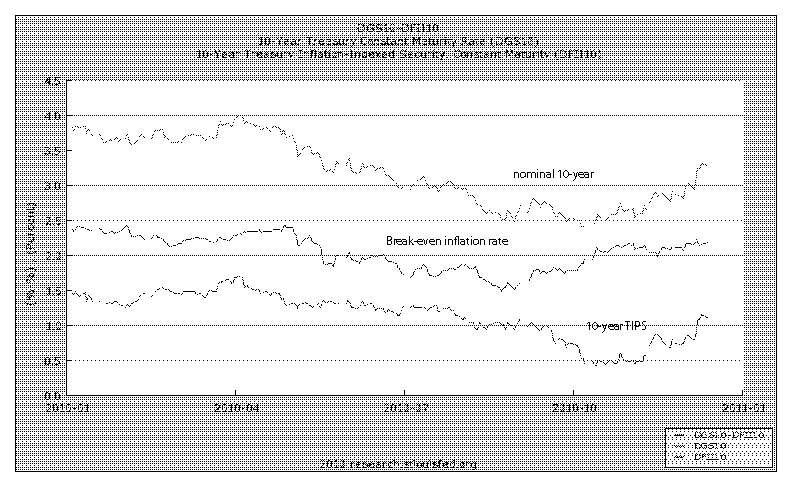 The top line in the chart (sorry for the crappy chart, by the way) is the nominal yield on 10-year Treasuries. Encouragingly for the Fed, this rate fell in the period when it was becoming clear that the Fed would embark on some kind of quantitative easing program, leading up to the November 3 QE2 announcement. Better still, the 10-year TIPS yield, the bottom line in the figure, fell during this period, and by more than the nominal yield. We can take the 10-year TIPS yield as a measure of the real rate of interest over a 10-year period, which is what the FOMC proponents of QE2 would think of as the real rate of interest relevant for influencing economic activity. 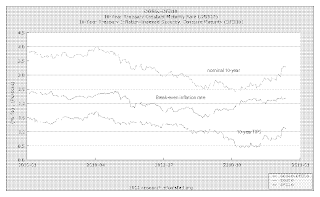 Note as well that the break-even inflation rate (the inflation rate required to equate realized rates of return on nominal bonds and TIPS - the difference beween the nominal bond yield and the TIPS yield) rose over the period leading up to November 3. This is even better for the Fed, as it reflects an increase in inflationary expectations. Now, what has happened since November 3? The break-even inflation rate has stayed roughly constant, but both the nominal bond yield and the TIPS yield have increased substantially. Is this an embarrassment for the Fed or not? At the minimum, this could indicate that it is not feasible for the Fed to target a long-term bond rate. The argument against that view is that the Fed actually was able to peg long-term bond rates in the period prior to the Treasury-Fed Accord in 1951, but maybe circumstances are different now. In any event, presumably all that the proponents of QE2 should care about is that they can lower real bond yields below what they would otherwise be. What could be driving up long bond yields then? 1. People are more optimistic about future aggregate economic activity. Standard theory tells us that, if we expect aggregate income to be higher in the future, we want to borrow against that future income, increasing the demand for credit, and real interest rates then have to increase. Certainly we have had some good news, for example there was an upward revision in third-quarter real GDP growth, and retail sales growth has been strong. On the down side, industrial production and employment have been anemic, and housing starts are still in toilet. This seems like a wash to me. Keynesians might add, however, that the likely extension of the Bush tax cuts, extension of unemployment insurance, and other temporary tax cuts, will add stimulus. More on this below. 2. The world demand for US Treasuries is falling. The World as a whole is recovering well. The back pages of the December 11-17 issue of The Economist tell me that world economic growth is back to pre-crisis levels, and is expected to be about 4% for 2010. In spite of continuing sovereign debt problems in Europe, the flight to quality is over, there are now better private substitutes for public liquidity, Treasury prices are falling, and Treasury yields are rising. I think this could be a big part of what is going on. 3. The increase in bond yields reflects a higher default premium. The tax bill making its way through Congress will contribute to a higher government deficit and a larger quantity of government debt. Further, there are no serious plans for medium or long-term deficit reduction. Therefore, lenders may want to extract a larger default premium from the US government. I don't think there is anything to this. The US government will inflate the debt away and default on it implicitly before they default explicitly. Note that there has been no increase in the break-even inflation rate, i.e. no increase in inflation expectations, recently, so there is no indication that lenders are anticipating implicit default on US Tresuries, let alone the explicit kind. 4. Higher deficits increase interest rates. Ricardian equivalence tells us that any reduction in current taxes is offset by higher future taxes (government spending held constant), with no net effect on private wealth. As a result, nothing happens. Consumers simply save the tax cut. We all know, however, that credit market frictions, wealth redistribution, and the distorting effects of taxes all make a difference. Of course, there is no escaping the intertemporal government budget constraint. We should always think of a government deficit as deferred taxation. In any event, to the extent that elements of the tax program relax credit constraints (through extension of unemployment insurance benefits, for example) this can put upward pressure on interest rates. What's the conclusion? I think that the yields on US Treasuries are currently being driven mainly by the demand for Treasuries outside the US, and that these other factors are minor (1 and 4) or inconsequential (3). The New York Fed released its plan for the second month of QE2 purchases, and this is available here. Essentially, this is identical to the first month, with a $75 billion net addition to the Fed's Treasury security holdings over the next month being the target, and an allowance of $30 billion in gross purchases for agency securities and mortgage-backed securities that are predicted to run off within the month. You can see some of the effect on the Fed balance sheet of QE2 operations up until now, in the first chart. In the reported numbers, there was an increase of about $54 billion in securities held outright (blue) by the Fed from the week of November 17 to the week of December 8, a $67 billion increase in reserves (red), and a $3 billion increase in currency in circulation (green). There is a lot of slippage in these numbers due to other entries on the Fed's balance sheet and lack of seasonal adjustment, but until now (roughly) most of the new Treasury purchases showed up on the liabilities side of the Fed's balance sheet as an increase in reserves. It will be useful to track some monetary quantities as QE2 progresses. 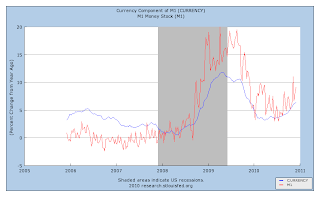 With that in mind, the second chart shows the percentage change, year-over-year, in the currency component of M1 and in total M1 (at a weekly frequency). 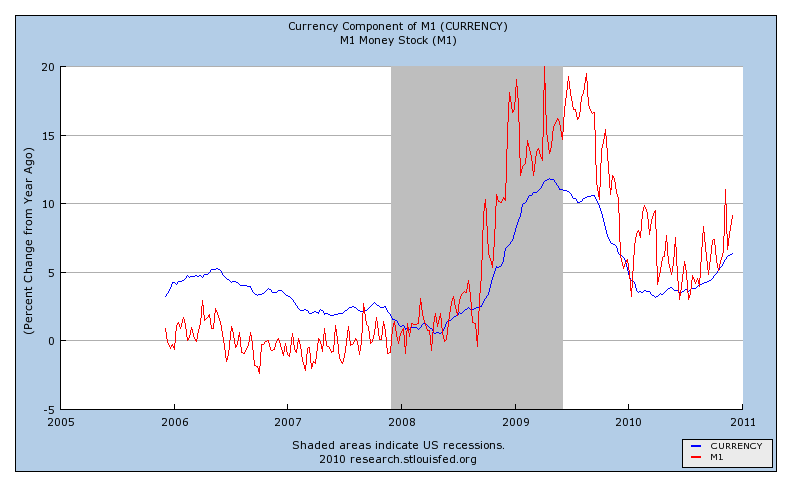 Note that currency is currently about 6% higher than a year ago, and M1 is about 9% higher. Percentage growth rates in both quantities have been increasing since late spring of 2010. Certainly the necessary conditions are there for QE2 to produce more inflation. When and if the inflation actually happens is another question. In all such exercises, you’re looking for the “signature” associated with one or another story; and the signature here is clearly the one you’d expect with a general fall of demand. Keynes roolz. I'm getting a picture of Krugman jumping around his living room in his underwear, like Tom Cruise in Risky Business. Seems to me that sloppy thinking roolz. 1. Krugman's numbers are consistent with sectoral reallocation. Krugman's data consists of observations on aggregate hiring and separations at the establishment level. Separations will in general include workers who leave an establishment to work in another establishment, either in the same sector or in another sector of the economy. In sectors where the employment share is increasing, hiring will of course tend to be high, as this is necessary to expand employment, but separations will tend to be high as well, since this is in part how workers move up the ladder. Workers with human capital specific to the sector move to higher paying jobs that are not available in their own establishment, possibly by forming their own firms. In declining sectors, hiring is low, but separations are low as well. Workers find it difficult to move up the ladder in their own sector, but moving across sectors is insufficiently attractive, because their human capital is specific to the sector in which they are currently working. What do we observe in the aggregate? The key idea is that sectoral reallocation frictions imply that, when there is unusually large dispersion in cross-sectoral factors - technological change or demand factors - aggregate hiring and separations will both be low. First, establishments in sectors growing relatively quickly will not be hiring as much as they would if workers did not have to acquire new skills or move across geographical regions to work in a different sector. Second, in sectors growing relatively slowly, separations are lower than they would otherwise be because moving across sectors is costly, due to skill acquisition and relocation. 2. "Deficient demand," is a cop out. In the mind of an Old Keynesian, if real GDP goes down, this is always due to deficient demand. By virtue of national income accounting, we know that some component of GDP decreased, and the Old Keynesian can then say that we have experienced an "autonomous" decrease in aggregate demand. Of course, this doesn't explain anything. We would like to know what caused some economic agents to be spending less. In New Keynesian models, at least the ones that do not degenerate into Old Keynesian language, one actually has to be explicit about what aspects of preferences, endowments, technology, or policy, are acting to cause aggregate fluctuations. In a fully-articulated New Keynesian model, just as in any fully-articulated general equilibrium model, "aggregate demand" does not have any meaning. It is possible to tie Keynesian ideas to coordination failures and multiple equilibria, as was popular in the past (see this), but that is not what Krugman and company are up to. What are the Costs of Inflation, and How Should We Measure It? As inflation and its costs could become more important to us soon, I thought it would be useful to consolidate some key ideas. As well, this is much more interesting to me than whether people in Congress want to, or do not want to, tax rich people. During the 1970s, prior to the Volcker disinflation of the early 1980s, economists and the public-at-large seemed to be having a hard time understanding the costs of inflation. There was public dissatisfaction with high inflation rate at the time, but the reasons for this dissatisfaction seemed vague, and had little to do with what was known about the economic costs of inflation. During this period, someone told me to read this paper by Robert Solow. Solow came to the conclusion that the moderately-high inflation rate in the US during the 1970s was not such a big deal, and that the best strategy was to just live with it. Obviously Solow's views did not prevail, and the Volcker disinflation was much less costly, in terms of lost economic activity, than Solow and others anticipated. Since the Volcker disinflation, inflation in the United States has been low-profile in the minds of most people, outside of policymakers in the the Federal Reserve System and some groups of monetary economists. However, given our recent central banking experiments, which have greatly expanded the Fed's balance sheet, and increased the probability of higher inflation, everyone should have inflation on their minds. Anticipated Inflation: This is by now well-understood. In a host of monetary models, inflation causes price distortions that misallocate resources. These distortions are associated with the use of non-interest-bearing money as a medium of exchange. The higher the rate of inflation, the lower the real rate of return on money, and the less money we want to hold, in real terms. We then have less real money balances to support exchange, leading to lower consumption and lower aggregate output. The costs of anticipated inflation are straightforward to correct with monetary policy. Milton Friedman told us in his 1969 "Optimum Quantity of Money" essay how to do this. Essentially, the idea is to conduct monetary policy in such a way that the nominal interest rate is always zero, in that a positive nominal interest rate typically represents the presence of a distortion. This is a "Friedman rule," whereby a zero nominal interest rate acts to equate the rate of return on money with the rate of return on other safe assets, and this can be achieved with trend deflation. There are different ways to implement the Friedman rule, though. For example, an alternative to trend deflation is to pay interest on money at some market rate of interest (say the interest rate on Treasury bills). Of course, the stock of money issued by the Fed consists of two components, currency and reserves, and it does not seem feasible to pay interest on currency. However, interest can be paid on reserves, as has been the case in the United States since late 2008. Indeed, part of what motivated the Fed to convince Congress to permit the payment of interest on reserves was Friedman-rule considerations. Note, though, that the reserves on which the Fed, and other central banks, pay interest are only reserves held overnight. Financial institutions do not earn interest on their daylight reserves, though in the US they pay interest on negative balances, i.e. "daylight overdrafts." In principle, daylight reserves should also bear interest. For example, if financial trading took place on a 24-hour basis so that there was no overnight shutdown in trading (as may well be the case in the not-too-distant future), it seems clear that payment of interest on reserves should take place continuously. Sticky price distortions: New Keynesians focus, sometimes exclusively, on costs of inflation related to price stickiness. If there is general price inflation, if firms change prices infrequently, and if firms do not coordinate price changes, then there will be relative price distortions. Firms selling the same goods and services under the same conditions will in general be charging different prices, and this is economically inefficient. There is also a monetary policy fix for this problem, though it is different from the Friedman rule prescription for eliminating the positive-nominal-interest-rate distortion. Typically, price stability - achieved with the appropriate monetary policy rule - acts to eliminate sticky-price distortions. If the average level of prices is not changing over time, then firms need only change their prices due to real factors affecting their production technologies, the costs of inputs, or the relative prices of outputs, and this is efficient. Unanticipated Inflation: Older discussions of the costs of inflation, for example in the Solow piece discussed above, tended to view the effects of unanticipated inflation only as unanticipated redistribution with no particular efficiency implications. The idea is that, since most debt contracts are written in nominal terms, an unanticipated inflation will tend to redistribute wealth from lenders to borrowers. In terms of aggregate welfare, this should not be something we would get too excited about. However, I think economists are beginning to take the costs of unanticipated inflation more seriously. Generally, there are two problems with inflation uncertainty. One is an ex post problem, and the other is an ex ante problem. First, the ex post costs result from the fact that default is costly. For example, an inflation rate that is lower than expected will increase the real debt burdens of borrowers, increasing the likelihood of default. Default is costly, as it can lead to legal costs from bankruptcy, or to the transfer of collateral, which tends to be an inefficient reallocation of assets (because the borrower values the collateral more than the lender does). It can also be costly for the inflation rate to be higher than expected. This reduces the real value of debt, which could ultimately lead to default as well. Why? Firms and financial institutions can simultaneously be lenders and borrowers. If the value of what is owed to me falls in real terms, this may impair my ability to pay off my creditors, possibly causing me to default on my debts, further impairing the ability of others to make good on their debts. As well, consider a case where the inflation rate rises in an unanticipated manner, and then stays at this higher level for a long period of time. Through a Fisher effect, this would tend to increase all nominal interest rates. This tends to squeeze financial intermediaries, for example banks, that borrow short and lend long, and these financial intermediaries could end up defaulting. In terms of ex ante costs, inflation uncertainty will tend to reduce credit market activity, since both borrowers and lenders will want to reduce their exposure to unanticipated changes in their net wealth due to unanticipated inflation or deflation. Benefits from Anticipated Inflation: The key costs of anticipated inflation fall on the holders of central bank liabilities - currency and reserves. But in some cases, we may not care so much that these liability-holders are suffering. A large fraction of US currency is held either outside the United States, or by people who are using it for nefarious purposes. Inflation is a tax on central bank liabilities, and perhaps the taxation of people who are not US residents or who are trading illegal drugs or evading income taxes would be a good idea. Now, no one has written down a quantitative model with all the features I have described above, which can tell us the optimal inflation rate that the central bank should deliver. The Fed seems to have converged on 2% as an implicit inflation target, but that seems based on experience more than anything, i.e. with a 2% inflation rate, no one seems to be complaining much. Now, there are many ways to measure the inflation rate. Different approaches to measurement can produce quite different inflation numbers, so it matters practically which inflation measure the central bank chooses to control. What do the considerations above tell us about this choice? In New Keynesian sticky-price models, if some prices are flexible, while others are sticky, then the only prices we care about are the sticky prices, since it is the price stickiness that is leading to inefficiencies in such a model. It is tempting, then, to argue that the price index we should be interested in should be one that excludes goods and services with volatile prices. The presumption is that sticky-price goods will have prices that are less variable than the prices of flexible-price goods. In principle, this need not be the case, since the price of a good could change infrequently, and yet the variance of that price could be relatively high, due to the fact that price changes are very large when they occur. In practice, however, the consumer price index excluding food and energy (the "core" CPI) seems to include what a New Keynesian would consider sticky prices, while excluding the flexible ones. 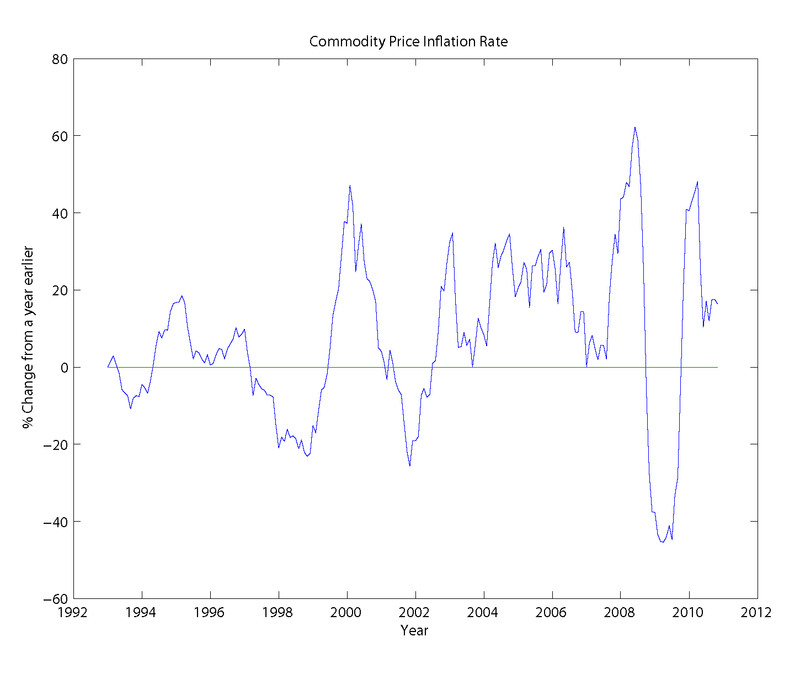 However, what about the costs of inflation that have nothing to do with price stickiness? Why would those other considerations cause me to eliminate some prices from consideration in my price index? Maybe there are other prices I want to include, other than what is in the CPI, or in some other measure of the price level? Consider the costs of anticipated inflation. Central bank liabilities are being used not only to purchase final goods and services, but to settle debts, to purchase assets, and to purchase intermediate goods and services. Thus, how individuals, firms, and financial institutions choose to economize on their holdings of central bank liabilities will depend not only on the prices of final goods and services but on asset prices and the prices of intermediate goods and services. How should we take that into account? The key issue is that many assets, including money, may be bought and sold in a chain of transactions by which a consumer reallocates consumption intertemporally. You see this, for example, in some models of payments arrangements, for example the payments models that Scott Freeman worked with in the 1990s. These considerations introduce other kinds of distortions which are determined in part by how economic agents participate in financial markets, and by central bank intervention, for example in terms of daylight overdrafts. Some of these considerations could lead us to include more prices in our measure of inflation, rather than fewer. How would the costs of unanticipated inflation be reflected in the choice of a price index for a central bank to focus on? Here, the issues are closely related to those we discussed in connection with anticipated inflation. The costs that arise have nothing to do with whether individual prices are sticky or flexible, smooth or volatile. There may be good reasons to include intermediate goods prices, or prices of final goods and services that are not consumption goods. Further, unanticipated-costs-of-inflation considerations should lead central banks to prefer price level targeting over inflation rate targeting. With pure inflation rate targeting, history does not matter so that, for example, the Fed targets this year's inflation rate at 2% whether last year's inflation rate was 0%, 5%, or 3%. Price level targeting requires that the central bank adjust for previous errors. If the actual inflation rate for the current year falls below the 2%, the central bank targets next year's inflation rate at higher than 2%. In this fashion, we know what inflation rate to expect over any horizon, and debt holders can be more certain of realized rates of interest over any maturity. Where does this leave us? We cannot determine the appropriate inflation measure for a central bank without constructing a model that captures all of the key factors above, and without knowing what the central bank's objectives are. However, I think we can at least say that exclusive focus on measures of "core" inflation - the core CPI or core PCE index - seems wrongheaded. These measures were developed in the 1970s, seemingly to take the heat off policymakers by focusing on inflation measures that would yield lower inflation rate numbers. Before recent New-Keynesian justifications for core-inflation targeting, the typical argument was that movements in volatile prices, like those for food and energy, are more likely to be temporary, and we want to restrict our attention to price movements that are more likely to be persistent. Of course, some changes in prices that have been volatile in the past can be highly persistent, and some changes in in prices that have been very smooth can be temporary. Presumably it is preferable to make these judgements based on the economics rather than building this into our inflation measures. I think it is easy to make the case for the use of the broadest possible measures of inflation. While traditional thinking might tell us that we should focus only on the prices of consumer goods, the fact that the prices of many other goods, services, and assets, can matter for the costs of inflation, through the chain of transactions, should lead us to consider broader measures. Even the Gross Domestic Product Deflator - essentially the price of final output in the United States - may not include all that we want in a price index. Apparently Krugman is one of those people who reserves macro for one part of his brain, and micro for the other, and the two parts do not converse. Here, he seems to forget all the trade theory he knows. A trade deal with South Korea turns out to be a bad thing. The potential increases in exports and imports turn out to be a wash, according to Krugman, and do not increase "demand," so there is no effect on GDP. Further, employment will actually go down, i.e. "demand" does not change, effectively productivity has gone up, so employment must decrease. Sometimes a little knowledge of national income accounting can be a dangerous thing, apparently. The trade deal with South Korea may indeed have a small effect, but US GDP has to increase. This is just basic gains from trade, which Krugman of course is quite familiar with. As for employment, the effect will work in a manner similar to a productivity increase. There are income and substitution effects, and it could go either way. In any case, we are better off as a nation. It was a great thing when macroeconomic thought was integrated with what everyone else in economics was doing - in international trade, public finance, industrial organization, and general equilibrium theory, for example. It's too bad that some people want to take us back to the Dark Ages. You can see Bernanke's 60 Minutes interview here. Not much new here, but one thing of note. Bernanke says that the fear of inflation from QE2 is "overstated." Further, he says that the notion that QE2 involves printing more money is "a myth." What the Fed is really up to, according to him, is "lowering interest rates by buying Treasury securities." Maybe these comments were lifted out of context, but of course this is not correct. If we take "printing money" to be the issue of outside money, then that is exactly what the Fed has to do to purchase Treasury securities, as we all know. Bernanke could have explained some of the subtleties of what potentially happens to the increased stock of reserves that the Fed exchanges for long-maturity Treasuries, but that's certainly not what came across in the interview. There are two respects in which standard theory tells us the zero lower bound on nominal interest rates matters. First, when short-term nominal interest rates are zero, conventional open market operations do not matter - there is a liquidity trap. If the central bank swaps zero-interest-rate reserves for zero-interest-rate Treasury bills, this should be irrelevant, in that no prices or quantities change. Further, a liquidity trap is also a feature of regimes like the one we currently have in the United States. 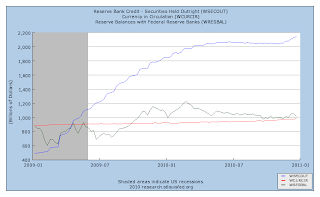 When there is positive supply of excess reserves in the financial system, and reserves bear interest, then the interest rate on reserves (IROR) is determining all short-term interest rates. If the central bank swaps reserves for Treasury bills, that will also be irrelevant under current circumstances. Of course (again, under current circumstances), if the central bank lowers the IROR, this will not be irrelevant. The problem for the Fed is that, with the IROR at 0.25%, there is little room to move. As Ben Bernanke stated in his Jackson Hole speech, a decrease of the IROR to zero would have little effect and "could disrupt some key financial markets and institutions." It certainly seems correct to say that lowering the IROR to zero would have little effect, but arguing that this would be disruptive seems wrong. In any case, this was part of the argument for QE2, the recently-embarked-upon purchase of $600 billion in long-term Treasury securities by the Fed, under the premise that something needed to be done, and there was no other avenue to pursue. Second, the zero lower bound on short-term nominal interest rates plays an important role in New Keynesian analysis. In a typical New Keynesian sticky-price model (e.g. see Woodford's book) the nominal interest rate is the policy instrument, and in some versions of these models it can be manipulated to achieve efficiency. Under the appropriate monetary policy rule, the "output gap" can be closed, and the flexible-price equilibrium is recovered, which is the equilibrium of the underlying real-business-cycle model. However, the zero lower bound can get in the way. There can be circumstances where the real interest rate is too high, relative to what it would otherwise be with flexible prices, but the nominal interest rate is at the zero lower bound, so that monetary policy is powerless, in terms of closing the output gap. This is basically the idea in this paper by Eggertsson and Woodford. Now, apparently some central banks in the world are not constrained by the zero lower bound in the way that the Fed appears to be. Indeed, as you can see here, the Swedish central bank set its "deposit rate," its version of the IROR, at -0.25%, from July 2009 to September 2010. If this had been possible in the United States, this would seem like a simple solution to the Fed's current policy problem. There seems agreement on the FOMC for expansionary policy, and a straightforward way to implement this, rather than engaging in a massive experiment in long-maturity Treasury purchases, would have been to charge financial institutions for the privilege of holding reserves. Is this even feasible? Well, probably not. If you follow the links from here, you will not find anything to indicate that negative interest on reserves is legal in the United States. 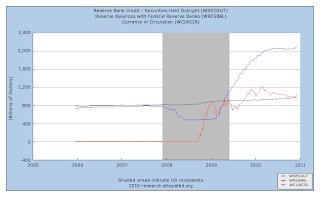 Congress gave the Fed the power to pay interest on reserves held by depository institutions. This legislation came with at least two flaws. First, the power to change the IROR was given to the Board of Governors rather than the FOMC, where such power would appropriately reside, given the importance of the IROR as a policy tool. Second, the legislation did not permit the payment of interest on reserves held by GSEs (i.e. Fannie Mae and Freddie Mac), which in practice has created a gap between the IROR and the fed funds rate. Add to these flaws that the legislation does not permit a negative IROR. Presumably this is not allowed as it would be interpreted as a tax. So much for foresight. Given that the IROR cannot be negative, does this mean we are stuck with the zero lower bound, and the relative price distortions that are the concern of New Keynesians? Well, no. As discussed in this speech by Narayana Kocherlakota and in this paper and this one, fiscal policy gives us a lot of flexibility. Basically, in New Keynesian models, the problems created by sticky prices are relative price distortions which lead to a misallocation of resources. What could be more natural than correcting such distortions with fiscal policy, given a sufficiently rich array of taxes? The papers I link to above show that efficiency can be achieved in sticky price environments solely with appropriate taxation. Further, there are inventive ways to manipulate tax rates so that the zero lower bound no longer matters. Unless we think that fiscal policy is somehow constrained (e.g. the legislative process is too awkward) relative to monetary policy, this casts some doubt on the New Keynesian approach to monetary policy, as set out in Woodford's "Interest and Prices." The sticky price problem, if it exists, appears to be a problem more appropriately addressed with fiscal policy instruments than monetary policy instruments. Further,the solution is not an Old Keynesian program of expansion in government purchases of goods and services, but could be a revenue-neutral change in taxes.